Whoever ordered a quiet weather pattern is rejoicing in their decision. We are now in, perhaps, the longest stretch of calm days that we’ve had in months. The confidence in this is quite high too. For example, I ran the 500mb heights for Denver from the past 6 GFS runs (0z and 12z) and notice the consistency from run to run! Remarkable, but understandable in such a pattern. This graph indicates no major pattern shift in the next week, just minor fluctuations. The trough indicated on October 2nd was part of the late week frost/freeze event, and Denver’s first freeze of the season (morning of October 3rd). However, this will change in time. We have two players in regard to a late week change to our current calm pattern: that Great Lakes low, and a tropical low near the Baja of California. The low will grab cooler Canadian air to push as a cold front over the region by Thursday and Friday. Meanwhile, the tropical low will scoot over Arizona and New Mexico toward Kansas by week’s end. The combination of that “cold front” (honestly just cooler air this time, not cold) and the tropical moisture will be best felt east of us. However, enough of the two will bring an increased, albeit small, rain chance as the cooler air swings through Denver and the Front Range by Thursday and Friday into the weekend. Under the current pattern expect mostly sunny skies, and temperatures near to somewhat above the 30-year normal: that’s low to middle 70s for Denver through Wednesday. Does the blocking pattern break down? It does, and we can track that potential with my favorite teleconnections. 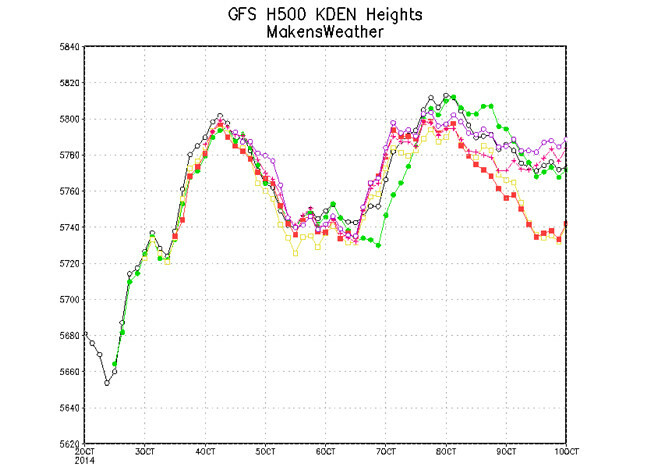 The “fab-four” indicate a pattern shift, minor one at that, by next weekend. The blocking pattern present now in the negative NAO,weakens and actually turns positive next week...that will indicate a more progressive pattern -- meaning more frequent systems by mid-October. 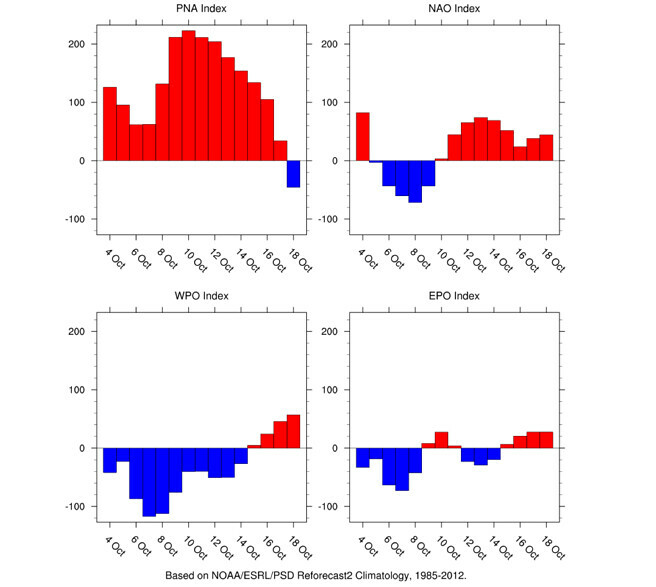 The WPO and EPO don’t give indication of any great cooling signals in that time, neither does the PNA. The PNA does quickly shift negative by the 18th, which will be something to watch. When teleconnections’ phase shift quickly, you need to look closer at what the atmosphere is trying to say. Since it’s so far away, I’ll make quick mention in this post and we’ll follow up soon in a lengthier discussion. That pattern shift indication at that time by the PNA is associated with a cold shift. With a progressive pattern we know we can have more frequent systems, but with the PNA negative phase shift around the 18th we will see a system from the north…a cold one. 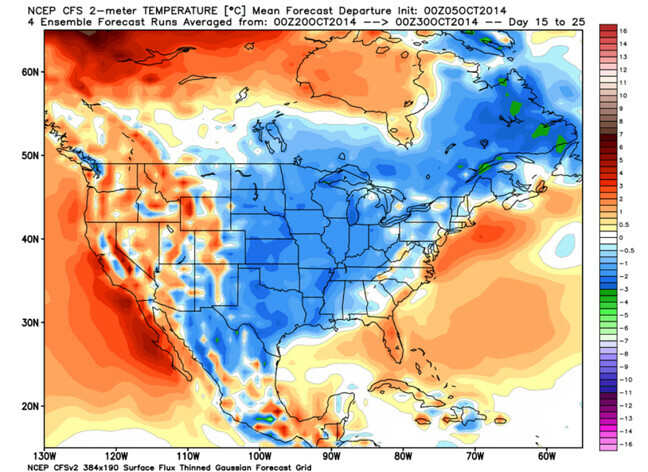 CFSv2 and ECM climate projections show that potential “cold snap” in just two weeks. Moisture from Tropical Storm Simon Headed for Colorado, but Where?